Ekornes introduced the Stressless® recliner in 1971. Meticulously developed and designed to provide your body with the ultimate in comfort and support while sitting upright or reclined. This revolutionary design has made Stressless® the ultimate recliner for the past 40 years and is even endorsed by the American Chiropractic Association. For decades we have been committed to our comfort philosophy while continuously refining and improving every detail. We continue our pursuit of perfecting the ultimate seating comfort of Stressless® recliners and sofas today. The innovation of the Stressless® Plus is integrated into our line of chairs, loveseats and sofas. Offered in both high- and low-back sofas, Stressless® offers individual adjustment of each seat for a personalized comfort. Ekornes. The Innovators of Comfort. Ekornes fabrics are made from high quality materials that provide great durability. Whenever we choose a new fabric for Stressless and Ekornes Collection, they have to pass through extensive testing to comply with the strict Ekornes demands. Only the best textiles that can withstand "hard use" and "normal use" are accepted. For families with children we recommend "hard use". Stressless offers you a completely new feeling of comfort; contemporary, warm and luxurious fabric collections that complement our range of leather categories. All available in a wide range of colours, so you'll find the perfect match for any interior. Simple cleaning, excellent utilization properties and a favorable price make Batick a good choice. Cori is an ultra-durable, beautifully rich pebbled leather that emanates color in a multi-tonal fashion. Due to its soft, natural and comfortable expression, Paloma is a very popular choice. Noblesse is the most exclusive leather quality offered by Ekornes, boasting a natural softness and lustre. It is also the most delicate leather, meaning regular maintenance is crucial to uphold its appeal. The Stressless base is made from laminated European beech, a light colored wood with an attractive grain and exceptionally suitable for staining in various colours. Also, beech wood furniture is extremely durable and made to last a lifetime. Each style is offered in multiple sizes to easily find a perfect fit for anyone. 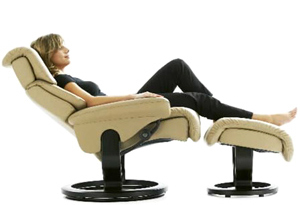 Stressless® by Ekornes recliners are the only recliners endorsed by the American Chiropractic Association. Guarantee your comfort by registering your Ekornes product on our guarantee registration page today.